White Millet, Wheat, Red Milo, Oats, Corn, Sunflower, Timothy Hay, Sun-Cured Alfalfa Hay, Soybean Hulls, Soybean Meal, Dried Beet Pulp (sugar removed), Carrots, Flaked Peas, Flaked Beans, Beets, Dicalcium Phosphate, Lignin Sulfonate, Salt, Hemicellulose Extract, Algae Meal, DL-Methionine, L-Lysine, Choline Chloride, Potassium Chloride, L-Ascorbyl-2-Polyphosphate (Source of Vitamin C), Vitamin A Supplement, Vitamin D3 Supplement, Vitamin E Supplement, Zinc Sulfate, Ferrous Sulfate, Niacin, Folic Acid, Biotin, Manganese Sulfate, Copper Sulfate, Calcium Pantothenate, Thiamine Mononitrate, Pyridoxine Hydrochloride, Riboflavin Supplement, Zinc Proteinate, Manganese Proteinate, Copper Proteinate, Calcium Iodate, Sodium Selenite, Cobalt Carbonate, Vitamin B12 Supplement, Dried Enterococcus Faecium Fermentation Product, Dried Lactobacillus Acidophilus Fermentation Product, Dried Lactobacillus Casei Fermentation Product. Red Milo, Oats, Corn, Wheat, White Millet, Sunflower Seeds, Flaked Beans, Peanuts, Green Split Peas, Flaked Peas, Flaked Carrots, Papaya, Beets, Green Peas, Bananas, Ground Corn, Brown Rice, Soybean Meal, Wheat Middlings, Ground Wheat, Timothy Hay, Sun-Cured Alfalfa Hay, Dried Beet Pulp (sugar removed), Vegetable Oil, Cane Molasses, Sugar, Canola Oil (preserved with mixed tocopherols), Dicalcium Phosphate, Algae Meal, Dried Enterococcus Faecium Fermentation Product, Dried Lactobacillus Acidophilus Fermentation Product, Dried Lactobacillus Casei Fermentation Product, Dried Egg Product, Flaxseed, Calcium Carbonate, Salt, Cranberries, Apples, Blueberries, Celery, Parsley, Lettuce, Spinach, Watercress, Brewer’s Dried Yeast, DL-Methionine, Hemicellulose Extract, L-Lysine, Choline Chloride, Potassium Chloride, L-Ascorbyl-2-Polyphosphate (Source of Vitamin C), Vitamin A Supplement, Vitamin B12 Supplement, Vitamin D3 Supplement, Vitamin E Supplement, Zinc Sulfate, Ferrous Sulfate, Niacin, Folic Acid, Biotin, Manganese Sulfate, Copper Sulfate, Calcium Pantothenate, Thiamine Mononitrate, Pyridoxine Hydrochloride, Riboflavin Supplement, Zinc Proteinate, Manganese Proteinate, Copper Proteinate, Calcium Iodate, Dried Yucca Schidigera Extract, Sodium Selenite, Cobalt Carbonate, Turmeric, Annatto Extract, Beet Juice, Natural Citrus Flavor, Natural Banana Flavor, Natural Pineapple Flavor. I was thinking I could just mix these 2 together, what do you think? If I did the math right it would be protein-13, fat-5.75, and fiber-8.5. I would just feel better to give a mouse food that's meant for a mouse, it probably doesn't matter though. While not a preferred mix imo, it would probably work ok. I use Vitakraft Vita Smart Parakeet Food and then give a few other things as treats. Most members here recommend this food for mice. Something to remember, just because a food is stated to be for mice, doesn't always mean it's good for mice. I've had my mouse for a little over a year now and his main diet is the parakeet food. He has always been a very healthy mouse and he loves this food. So you're saying you don't have experience with it. Can you tell there's something wrong with it compaired to the parakeet food? @Teddy545 wrote: So you're saying you don't have experience with it. Can you tell there's something wrong with it compaired to the parakeet food? I don't know. I've never done comparisons. I went with the parakeet food because that is what was recommended on this forum from many of the members who have been keeping mice for years. So that is why I took their advice. Other members here would be a lot better than me at analyzing foods. Hopefully one of them will respond soon. I'm not the best at this kind of stuff, but there looks to be a lot of corn and hay in the first one. Corn is a cheap filler with not much nutritional value, and while it is extremely hard to avoid in commercial foods, there are foods with less of it, which is better. Hay isn't something mice eat much of naturally. They usually just use hay as nesting material or something to chew on, it doesn't make a super good ingredient in a diet for them. And the second one appears to have quite a few sunflower seeds. Striped sunflower seeds should be limited, or avoided. I give them sunflower seeds as treat, but not often. Sunflower seeds are common allergens for mice, which is why one should be careful feeding them. For me, there's too many sunflower seeds and corn, plus what Anon said about hay. Added sugar isn't something I like to see either. These things can be tough to avoid in commercial mixes but you can find those that have a bit less or none. I do understand where you're coming from about species specific food but the truth is, most mouse foods are absolute crap. 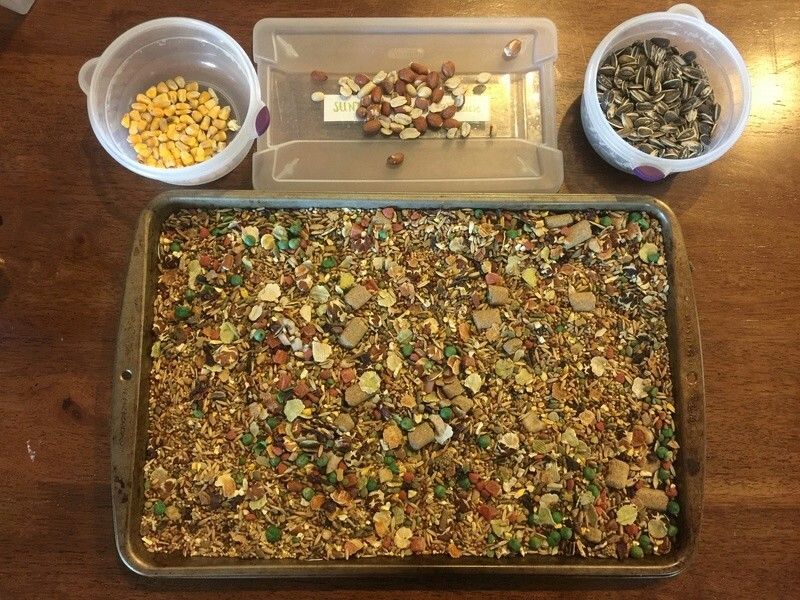 I personally choose to make my own grain mix (with a lot of research and calculating everything that goes into it) alongside two mouse specific pellet foods. But many here feed a parakeet mix as their main staple with very good results and I have in the past as well. There are a few recommended foods in the Diet thread found in the Nutrition section, along with other food/treat related advice. Oh, okay, I learned that hay isn't a good ingredient at least. Then I was thinking that I don't know what the breeder I want to get mice from feeds them. @Teddy545 wrote: Then I was thinking that I don't know what the breeder I want to get mice from feeds them. Yes definitely. If you're getting mice from a good breeder, they should be able to recommend what they find works best for their line. I spent my morning going through my bag of Higgins Sunburst rat and mouse food. There is a ton of sunflower seeds and quite a bit of corn and peanuts. I will definitely be buying the vitacraft parakeet food next time. I have the higgins food for mice&rats and the one for parakeets. I pick out all the corn, peas, and sunflower seeds! They are doing just fine. I leave a millet spray for them in the cage too. I will be buying the higgins hamster food because it has nice percentages (fat, protein) and I'll be mixing it along with their regular food. Not to mention I give them Mazuri Pellets which have a way too high protein but they don't really touch it anyway. It's a small boost I would say. They have fresh produce a couple times a week. Good luck! Picking things out of a commercial food changes the GA in ways that would be difficult to calculate. It's better to find a food that doesn't have these things (or has less of them), than to pick them out. In the Higgins mouse food I imagine this brings the protein and fat very very low, which were low to begin with in the one recipe. Which Higgins hamster food? The ones I've seen have too high protein for the average mouse from untracked lines. Mazuri is also way too high in protein (and full of corn and soy but I know this is not something everyone chooses to avoid or limit). Of course mixing lower protein foods in with the higher ones could balance it out, but with removing things from them this would be impossible to accurately calculate. @CallaLily wrote: Picking things out of a commercial food changes the GA in ways that would be difficult to calculate. It's better to find a food that doesn't have these things (or has less of them), than to pick them out. In the Higgins mouse food I imagine this brings the protein and fat very very low, which were low to begin with in the one recipe. Which Higgins hamster food? The ones I've seen have too high protein for the average mouse from untracked lines. Mazuri is also way too high in protein (and full of corn and soy but I know this is not something everyone chooses to avoid or limit). Of course mixing lower protein foods in with the higher ones could balance it out, but with removing things from them this would be impossible to accurately calculate. This would be because I am unable to buy Vitakraft here. I go to the pet store daily which is probably unhealthy. The ones that are available are 3 bucks and 75% corn. You're right about the Mazuri thing and I'll need to find a new food to mix in. So far my mice are fine but this can result in problems later on (tumor, obesity). And I was talking about the Higgins Garden for hamsters and gerbils. Oh I see. So you're working with the best that's available to you. It stinks how there's so many awful mouse foods out there. I'm happy people keep replying to my topic for some reason. I was wondering why it has to be those 2 brands of parakeet food and not other brands? I've been stressed out so I didn't get the mice yet. I've noticed the shelter by me has been getting mice now so I'm thinking about getting some from there.